You might fit: Antiallergic medicines for the nose . The tool is applied intranasally by injecting a spray into the nose when a dosing device is inserted into the nostril. Before the first use, you need to make 10 clicks to calibrate the device, after which Desrinite is ready for therapy. One dose (one press) corresponds to 50 μg of mometasone. If the medicine has not been used for 14 days, the calibration should be repeated. Shake the bottle well before each use. Adults, children from 12 years of age - 2 injections in each nasal passage once / daily (total dosage - 200 mcg). As the effect is achieved, the dose becomes supportive - 1 injection into each nostril once a day (100 μg in total). 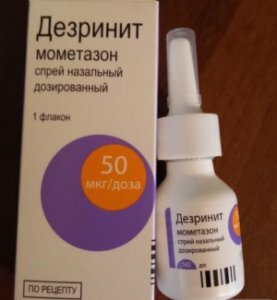 In severe rhinitis or no effect, in agreement with the doctor, the dose can be increased to 4 presses in each nostril (400 µg in total / day). Children from 2 to 11 years old - 1 injection in each nostril once / day (in total, the dose will be 100 mcg). Positive dynamics usually becomes noticeable 12 hours from the start of treatment. Adults, children from 12 years old - 2 injections in both nostrils (in total, the dose will be 400 mg / day). If necessary, you can increase the dose to 800 mg / day - up to 4 injections in each nasal passage twice / day. As the clinical picture decreases, the dose should be reduced. Adults over the age of 18 take 2 injections in each nostril twice / day (400 micrograms). As the symptoms decrease, the dose is reduced to 2 injections in each nostril once / day (200 μg). Studies on the use of the drug Desrinite in pregnant women and nursing was not conducted. The drug is used with caution, and only if if the expected benefit is higher than the potential risk. Children whose mothers were treated with GCS during gestation should be checked after birth for adrenal hypofunction. The systemic bioavailability of the drug is low (less than 1%), therefore, overdose incidence is unlikely. 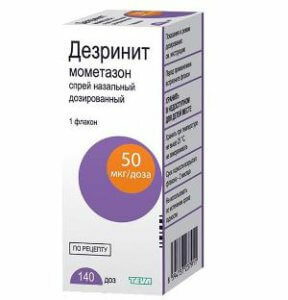 With the long-term use of local corticosteroids, especially in combination with taking systemic corticosteroids, there is a risk of inhibition of the activity of the adrenal glands, hypothalamus, pituitary. On the part of the nervous system - headache, psychomotor hyperactivity in children, anxiety, sleep disorders, depression. Allergic reactions - shortness of breath, bronchospasm, angioedema, anaphylactic shock. On the part of the respiratory system - nasal bleeding, the appearance of ulcers on the nasal mucosa, burning, irritation, pharyngitis, perforation of the nasal septum (rarely). On the part of the digestive system - irritation of the mucous membrane of the esophagus, pharynx. Other - violations of smell, taste, increased intraocular pressure, cataracts, glaucoma. 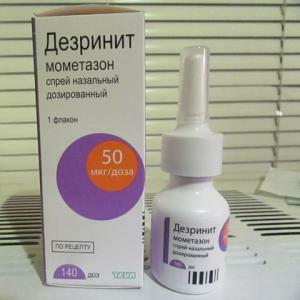 The main active ingredient is mometasone furoate monohydrate (glucocorticosteroid). Additional components are Avicel RC-591, glycerol, benzalkonium chloride, polysorbate, citric acid monohydrate, sodium citrate dihydrate. 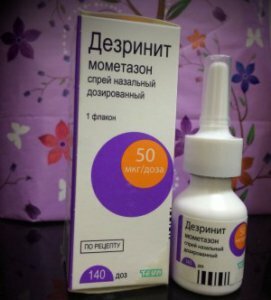 Synthetic corticosteroid of local application, mometasone has anti-inflammatory, anti-allergic effect. There is no systemic effect during treatment, the total bioavailability is below 1%. Part of the drug, which, when administered intranasally enters the gastrointestinal tract, is absorbed by the liver. 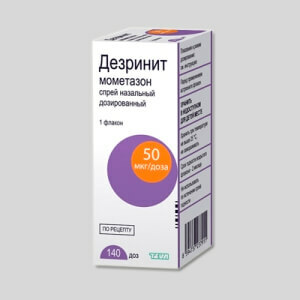 Disrinit inhibits the release of inflammatory mediators, inhibits the production of prostaglandins, cyclic endoperoxides. Inhibits the movement of macrophages, which reduces inflammation, infiltration, granulation. Reduces the formation of the substance of chemotaxis in allergies, inhibits the effect of late and early allergic reactions. The drug is available on prescription. Its shelf life at a temperature of 2-25 degrees - 2 years. Keep desrinit should be out of the reach of children.